As the U2 eXPERIENCE and iNNOCENCE tour hits its home run, one of the worlds' leading U2 tribute bands U2Baby (www.theu2tributeuk.com) has been raising the roof in both Slane and Dublin since Sunday evening. Those attending the gigs were delighted to hear the songs they've been asking to hear live such as A Sort of Homecoming, Bad and of course the mighty Where the Streets Have No Name. Ric Peace, singer in U2Baby said, "Not everyone can get to see U2 live, and there is no way every song can be played as U2 have such an extensive back catalogue. 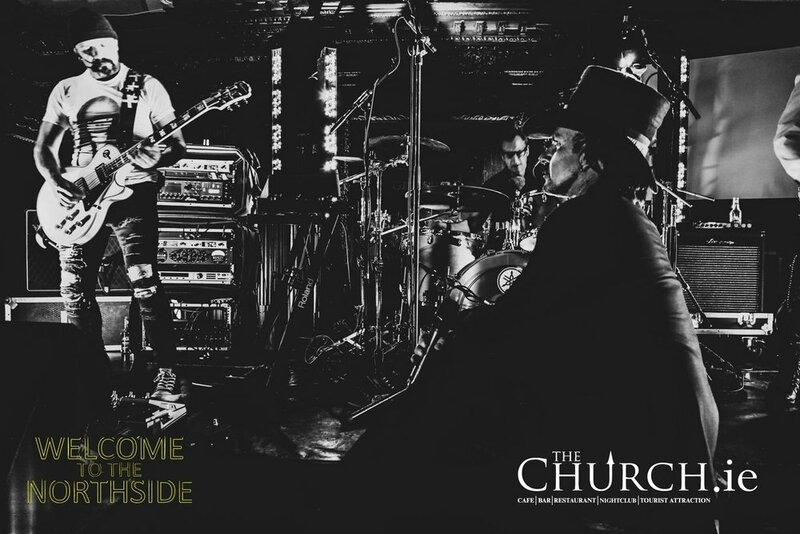 Our aim as a tribute to U2 is to fill the space between the current U2 tour and the iconic moments U2 fans love to relive." And this they certainly did at the WelcomeToTheNorthside events blasting out songs from Boy to 'Songs of Experience'. A tour of Slane Castle was a highlight for many visiting fans from across the globe; including Canada, Indonesia, America, and from all over Europe. A visit to the rooms where the Unforgettable Fire was recorded, meeting the lady of the manor, and dinner in the restaurant before an intimate gig with U2Baby at Boyles of Slane. Kellie Murphy, visiting from Ohio who was having a cigarette with the locals out the back said, "As soon as U2Baby started playing Streets the lads from Slane dropped their cigarettes and ran into the pub as it was so close to hearing the real thing." Back in Dublin, the Church was transformed into the "Lights of Home" exhibition with artwork decorating the entire venue based around the band’s tour visuals by AMP. A stunning sight for any U2 fan to see before they leave Dublin and a fitting backdrop for the weeks events. Monday and Tuesday saw four more gigs from U2Baby, before and after the U2 shows at the 3Arena. Opening with Love is All We Have Left the band segued seamlessly into Lights of Home setting the scene for an eXPERIENCE and iNNOCENCE extension to the evenings events. But then things got down and dirty as U2Baby turned the show on its head tearing into Electric Co and Gloria sending the U2 fans into a frenzy as they realised this show could almost be as good as seeing the real thing. Three songs in now and the atmosphere was pumping. The band changed pace performing classics such as Kite and bringing an emotional edge to the performance, amplified in part by the venue's auspicious setting. Returning to eXPERIENCE U2Baby played new songs such as 'Red Flag Day' and 'Get Out of Your Own Way' complete with megaphone before including an Augmented Reality Macphisto during Acrobat, the by now familiar alter-ego projection recreated in miniature for the supportive crowd. This tribute band has all the attention to detail you could ask for, right down to the Edge's jeans featuring album cover artwork. No stone seemed to be left unturned by U2Baby. The defining moment of the night for many was the iconic ZooTV version of Running to Stand Still into Where the Streets Have No Name. A crowd of U2 fans carried back to iNNOCENCE or certainly early adolescence. As the energy rose to a crescendo, the U2Baby singer commanded a stage presence that led many to say that they thought at times it was Bono. 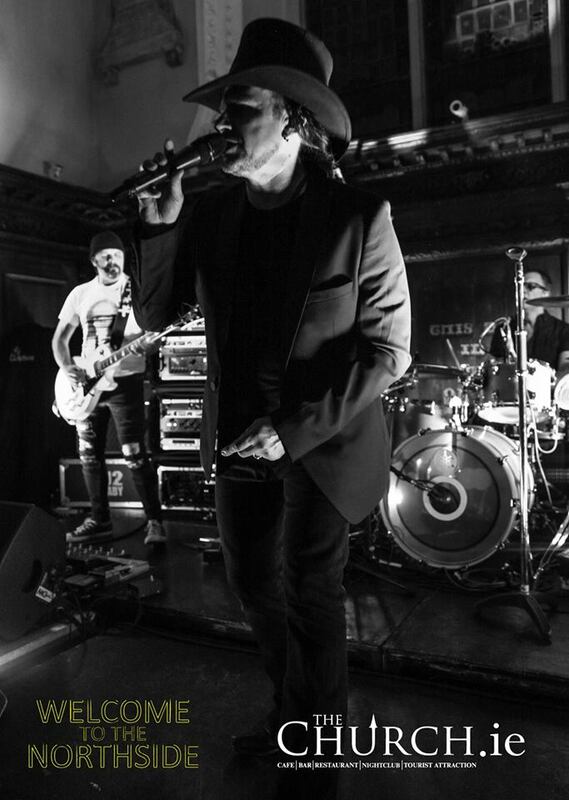 Shannon Breathnach posted on Facebook, "Front man really pulled out all the stops for Dublin 2 in the Church. What a showman. Really had to inspect him to check that it wasn't actually Bono. The sound and the look is identical." 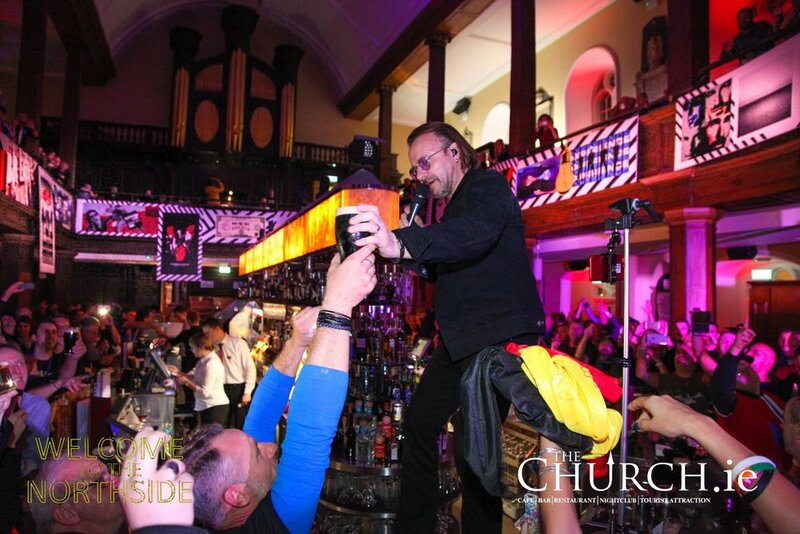 As he climbed up onto the Church bar in the centre of the room, the crowd turned in to face him, and the singing of the U2 choir echoed around the walls decorated with U2 art. One fan passed up a Guinness and it was held aloft in a toast to the incredible music of U2 that everyone had come to celebrate. 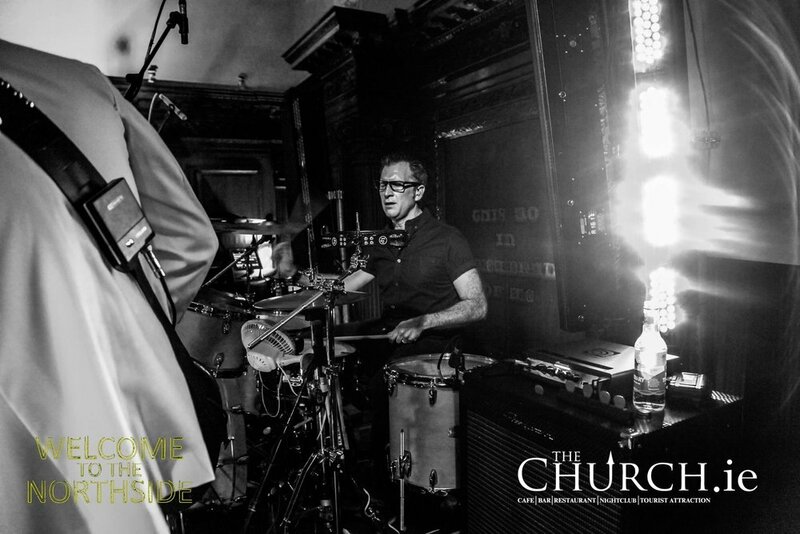 As the gig drew to a close, the singer acknowledged Stephen Browne and the Church for running such an incredible fan event reminding them it was done with free entry, and thanked U2, "...for giving us a great life." The event continues for the remainder of this week with DJ on Thursday night and Dublin based U2 tribute Zooropa taking up the reigns on Friday 9th and 10th after the U2 shows at the 3Arena.